I always knew that I wanted an outside wedding complete with a reception under the stars. I looked at so many places, but when I saw Lenora’s Legacy, I knew my dream wedding would become a reality. The natural scenario creates an elegance and relaxation that can only be created by nature. People who attended my wedding still come up to me today and tell me it was the most beautiful wedding they have ever seen, and I would have to agree. Lenora’s Legacy was my dream location for our wedding ~ with God’s creation as a backdrop. 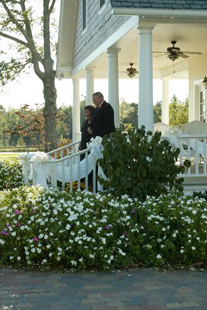 The house (with its beautiful furnishings) and the surroundings added a special touch of Southern elegance and beauty to our ceremony and reception. It was a pleasure to work with Janice and Jack Farrell, the owners, who share our love for God’s creation. Thank you for a beautiful wedding. Everything was outstanding. The setting and grounds were beautiful. 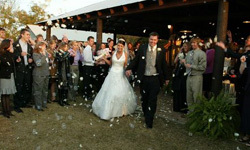 When we met with Janice at Lenora’s Legacy, we knew that is where we wanted to have our wedding. It is beautiful and relaxing. Jack and Janice helped us so much. They are wonderful people, and we made two friends. Our guests told us our wedding was the most beautiful wedding they had ever attended, and what a good time they had. We tell ourselves we wish we could do that day over again because everyone had a great time. 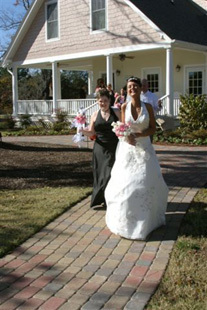 We would encourage any couple looking for a place to have their wedding to go see Lenora’s Legacy. It is beautiful! Thank you, Jack and Janice, for all your help. I want to thank you so much for letting us have our wedding at Lenora’s Legacy. The Farrells are such nice and helpful people. Comments that I have heard and have said myself were how beautiful the wedding and reception were. I still hear that it’s the perfect place for a wedding like we had, and I totally agree. It gives me chill bumps to think about it. I’m so glad that Lenora’s Legacy is where we got married because it’s so beautiful and it’s got the Southern touch to it. People have made so many comments on how I didn’t have too much decorating because the beauty of the facility just did it all. People who toured the house were just amazed with how beautiful it looked. I really loved the relaxed atmosphere at Lenora’s. 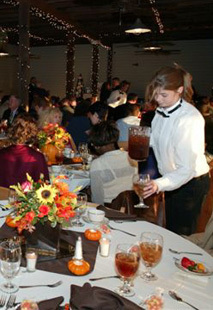 Guests were able to relax and not be uptight about dress. They really just got to socialize and enjoy themselves. Mrs. Mooney from Rainbow Sweets and Mr.Terrell (my photographer) have already recommended Lenora’s Legacy to other brides. I think that is wonderful. I recommend it to everyone who says they are getting married. It is truly a magical place. Once again, thank you so much for making our special day wonderful. I cannot begin to say how pleased I have been with my decision to hold our wedding and reception at Lenora’s Legacy. The facilities easily accommodated our needs while allowing us to spend the day enjoying our friends and family instead of traveling from one location to another. Everything that we needed was available to us at Lenora’s Legacy. The beauty of the property awed me from the first time that I visited until my new husband and I pulled away after a perfect wedding day. The beauty is still obvious in our treasured pictures. 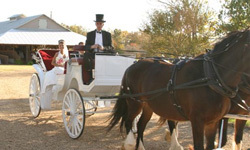 I strongly recommend Lenora’s Legacy as the location you choose for your special day. I can assure you that you will be very glad that you did. We just wanted to let you both know we are very thankful to have found Lenora’s Legacy and to have met two of the nicest people in the world. We look forward to sharing the most beautiful and the most important day of our lives at your place and with the two of you. Thanks for accepting us as a couple. That truly meant the world to us. When we first saw Lenora’s Legacy, we knew that is where we wanted to get married. Lenora’s Legacy was the perfect site for us. Rick and I absolutely love Lenora’s Legacy for several reasons. One, you guys were so helpful and accommodating to our needs and ideas. Lenora’s Legacy allowed us to have the wedding of our dreams. We always knew we wanted an outdoor ceremony and reception. We knew we wanted it to be really nice and semi-formal, but at the same time be really relaxed. We knew we wanted the reception to have a Southern flair and Lenora’s Legacy gave us that. 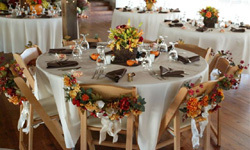 We were able to use decorations and seating arrangements we preferred. The outdoor facility allowed people to be able to get up and roam around and not to feel like they were stuffed into some banquet hall. We really liked being able to have choices. 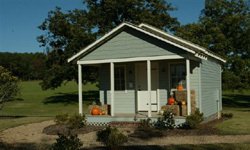 For instance, we had all the guest tables in the yard, which allowed the peach shed to be used for the dancing. Lenora’s Legacy gave us all that and a lot more. I really liked being able to have my bridal luncheon there in the afternoon before the ceremony. I also loved the bridal suites. It was wonderful to be able to get ready with my friends without being cramped. Being able to look out the window and see everyone arriving was great. Rick and I received tons of compliments on the location, and everyone kept remarking on how beautiful it was. We could not think of a better place for our wedding. Thank you for the wedding of a lifetime. It was everything I wanted and more. Your establishment is beautiful.